A beautiful day trip, this tour explores the water entrance of Puget Sound at the Strait of Juan de Fuca on Whidbey Island. The water access to Puget Sound, also known as the Salish Sea, is a water passage, not a mountain pass. You travel up Interstate 5 from Seattle or the airport to Mount Vernon, and drive through the Skagit Valley farming community on your way to the Deception Pass bridge. If you time it right in April, you can visit the tulip fields in Skagit Valley before making your way to the Bridge over Deception Pass. The rest of the year, the fields are full of all sorts of produce and berry bushes and show of the fertility of this extremely large valley. 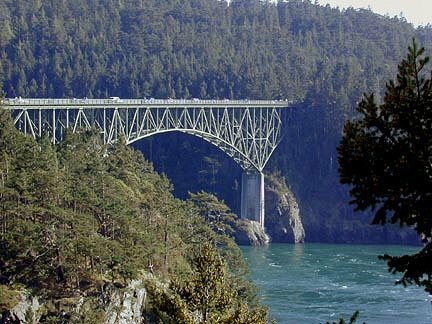 Just before reaching Whidbey Island, you come to the Deception Pass Bridge, named for the deception the surveyors felt when they realized Whidbey Island was an Island, not a peninsula. We stop here for the view, and you have the option to walk over the bridge (an awe-inspiring view!) or ride across with your driver. If you like hiking/walking, you have time to walk the .9 mile trail from the bridge to the shoreline in Deception Pass State Park. Your driver will pick you up there to continue your tour. Take a moment to walk the sandy and rocky, driftwood covered shore and watch birds and sea life where the Strait and ocean waters flow into and out of Puget Sound. Next stop, lunch in Coupeville. Coupeville is a wonder historic town with an historic block house and boasts the first dock on Puget Sound, originally used for lumber exporting and mail service to the island. Restaurants offer the usual fare of sandwiches, salads, seafood and burgers, or try the fresh shellfish; mussels are grown right there in Penn Cove. If time permits, you’ll see Fort Casey, an historic fort built around 1902, and Admiralty lighthouse. Several deer graze here, and sometimes but not always, we see them, along with rabbits, bald eagles, great blue heron, and other raptors. We saw an owl one day! You’ll have 20 minutes on the ferry as you leave the island for the mainland. Ferry’s really set the tone for a great Northwest experience. With nine crossings throughout Puget Sound, eighteen ferries are constantly in motion on this marine highway, where over 23 million passengers travel each year. That wraps up this fun day adventure, and we hope you’ll join us sometime! Visit our website for booking details: www.cherylsnwtours.com.